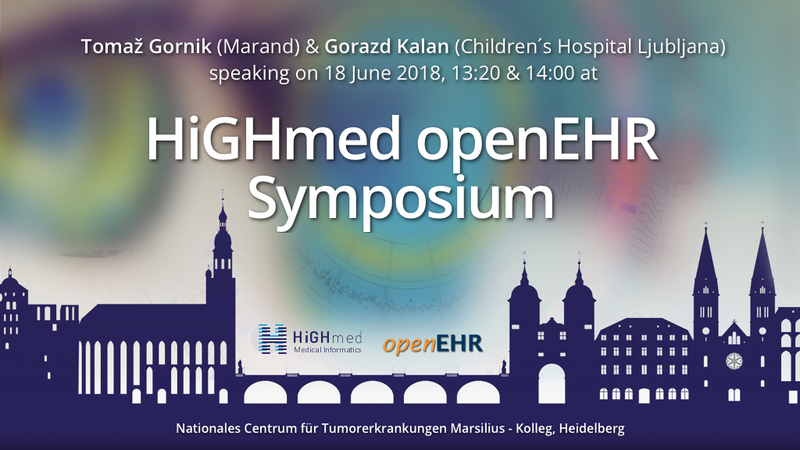 Today, 18 June 2018, the Heidelberg University Medical Faculty is hosting a HiGHmed Symposium on openEHR. Speakers will be discussing the opportunities and challenges of openEHR approach. They will also present international use cases, which prove that openEHR based solutions can be applied at any scale, enabling providers to meet the requirements of the HIMSS EMR Adoption Model Levels 6 and 7 (ratings run from 0 to 7). Better by Marand is sponsoring the event as a leading provider of solutions based on the openEHR approach. The openEHR approach is based on open standards and aims to transform health and social care by separating applications from clinical data. Such approach, which enables shared care records, is also known as the postmodern EHR. It has been recognized by Gartner Group in a recent research note, stating that truly effective and sustainable open architectures would need a capacity for vendor-neutral data persistence, such as utilizing a common scheme or set of archetypes and rules for managing structured and unstructured data. Tomaž Gornik, Co-Chair of openEHR Foundation and CEO at Better by Marand, will be speaking about the postmodern EHR and the need for interoperability. The key for healthcare providers is to set up an infrastructure that enables the development of an ecosystem of solutions around centralized, vendor-neutral and structured clinical data repository. This way, all patient data can be stored centrally and independently of the applications that created it and will be available for a lifetime of patients regardless of applications that might be deployed in the future. Setting up a centralized clinical data repository was the first step taken by the University Children’s Hospital in Slovenia on their way to a paperless hospital. Then they started rolling out individual clinical modules that covered their basic hospital process, such as ordering tests and nursing. Eventually, a closed loop medication management was deployed and today their medication management is completely paperless. The Children’s Hospital in Ljubljana is the first hospital in the world using a clinical system based on an open platform to be awarded HIMSS EMR Adoption Model level 6. As Gorazd Kalan from Children’s Hospital in Ljubljana will discuss in his presentation about their journey to a paperless hospital, physicians and nurses can now spend more time with patients. They have also improved safety, minimized errors and improved communication within medical teams.